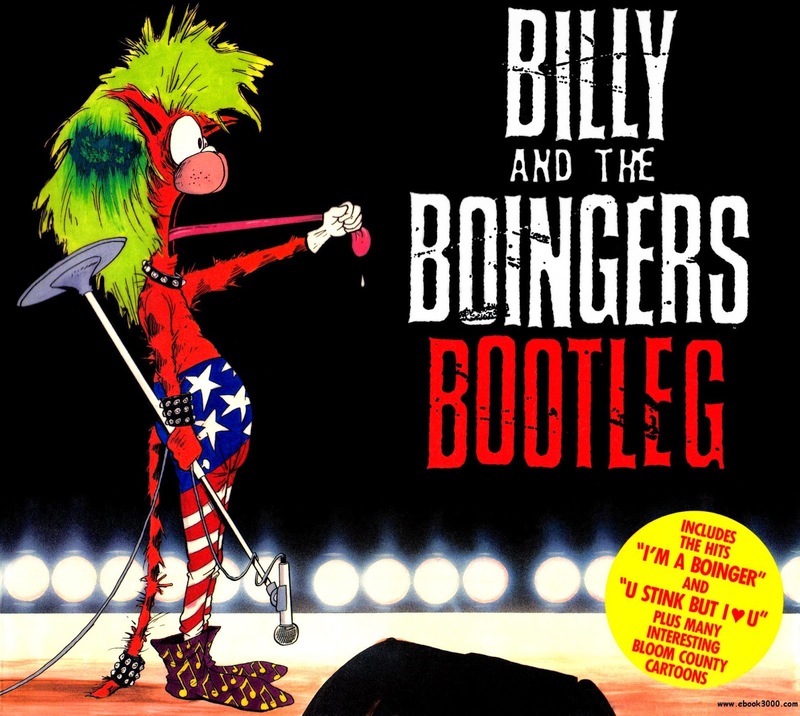 In 1986, Berkeley Breathed had some of the cast of Bloom County form a heavy metal band by the name of Billy and the Boingers, formerly Deathtöngue. (Opus played the sousaphone, a "weighty brass.") The comedy played out in the strip for a while, culminating in the band's one-stop world tour at the Hiawatha Room during the 1987 Albuquerque Moose Lodge Banquet. Pretty typically funny stuff from Breathed. 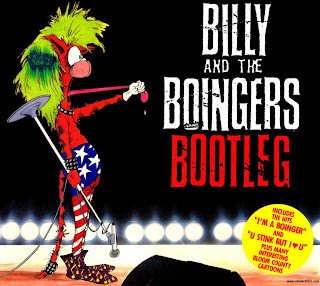 When the strips were collected into book form, it included a flexi-disc with two of the Boingers' songs on it. "I'm a Boinger" was in fact written by Richard LaClaire and performed with Scott Freilich, Rich, Kazmierczak and Mike Bryydalski who collectively were known as The Harry Pitts Band. As far as I can tell, this was their only recorded song. The b-side was "U-Stink-But-I-♥-U" by Bill Casler and performed with Chris Milnes, John Milnes, Danny Nastasi, and Scott Lepage. They formed the real life band Mucky Pup, and enjoyed a fair amount of success for ten years, releasing six studio albums. The band is still around (although with not entirely the original musicians) touring as recently as this past March. Both songs were chosen from reader submissions as part of a contest. Mucky Pup went on to record a video for their song, and it continues to be one of the band's closing numbers. Although non-winning songwriters weren't contacted at the time, some of have since come forward to place their recordings online. I'm still partial to "I'm a Boinger" though. A tongue, what a face! Was Bowie ever a fairy? Does Barbra wish she was a goy? Is George really a boy? I can't relax, 'cus I'm a boinger!